The first YMCA Garage Sale of the year is on this Saturday, 2 February. We didn't get to many last year, so am really looking forward to to this one. 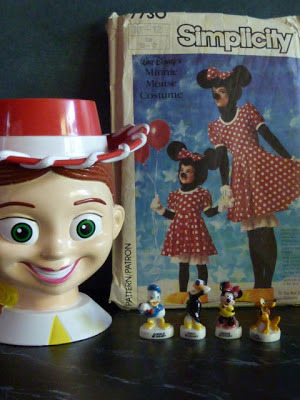 We have squeezed in a few visits to op-shops on the Southside, in January (it is handy that a Salvos shop is located in the same area as our Doctors). It seems there have been some cupboards been cleaned up over summer, and I have managed to add a number of sewing patterns to my collection. Just after Christmas we managed to find a set of leather bound Les Miserables books, published in the 1950's. Sorry no photo, as they were given away as a January birthday gift. The Salvos at Tuggeranong is apparently way overstocked with books - we picked up a some hard copy Harry Potters for $1 each, including some with the 'adult covers'. 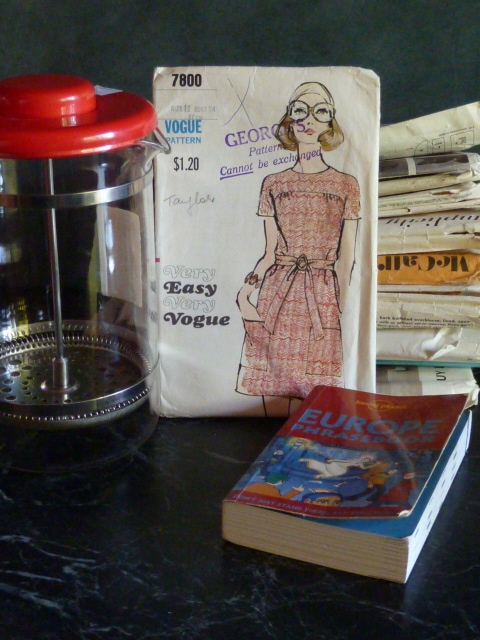 Vintage sewing patterns, a 12 cup Bodum, and European phrase book. ETA: with the Salvo's store - not Smith Family shop.